Published regularly, Faculty Perspectives highlights recent faculty scholarship at IIT Chicago-Kent College of Law. The newest issue highlights selections of our faculty’s work that pushes boundaries in the realm of law. In a piece forthcoming in the UC Davis Law Review, Kimberly Bailey highlights the impact of government surveillance on one’s self determination. Alexander Boni-Saenz proposes a revision to current sexual incapacity doctrine and how we view cognitively impaired adults’ ability to consent. In a piece forthcoming in the Minnesota Journal of Law, Science & Technology, Richard Warner and Robert Sloan examine the history of the East German police state for insight on current surveillance and privacy laws. Also in this issue, Daniel Katz unpacks his concept of a theoretical “MIT School of Law” and legal education that emphasizes practice. 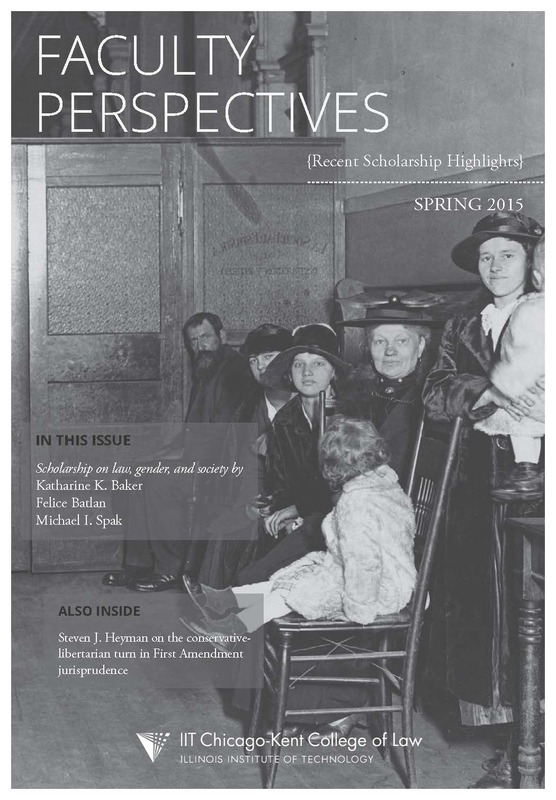 Read the Fall 2015 issue of Faculty Perspectives below or online at http://bit.ly/1I3XvjZ. Find more recent Chicago-Kent scholarship at http://www.kentlaw.iit.edu/faculty/recent-scholarship.